7 Awesome Stats from NFL Week 5 - Fantasy Football, Fantasy Football Rankings | Mac Bros.
Week 5 of the NFL season has nearly come and gone. Let's look back at 7 feats of statistical awesomeness. 1. Quarterbacks PHILIP RIVERS (1,759), KYLE ORTON (1,733) and PEYTON MANNING (1,609) have each passed for over 1,600 yards in their team’s first five games in 2010. 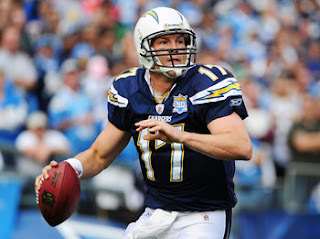 Rivers, Orton and Manning give the 2010 season three quarterbacks with at least 1,600 passing yards through their team’s first five games of a season, the first time in NFL history this has been accomplished. 2. Detroit kick returner STEFAN LOGAN had a 105-yard kickoff-return TD in the Lions’ 44-6 win over St. Louis, tied for the sixth-longest kickoff return touchdown in NFL history. ELLIS HOBBS (New England, September 9, 2007) holds the league record with a 108-yard return. The 2010 season is the first since 1970 with at least one kickoff-return touchdown in each of the first five weeks. 3. Chicago running back MATT FORTÉ rushed for 166 yards and two touchdowns in the Bears’ 23-6 win at Carolina. Forté, who had an 89-yard TD catch in Week 1, had a 68-yard touchdown run against the Panthers and is the fifth player since 1970 to record an 85+ yard touchdown catch and 65+ yard touchdown run in the same season. The last player to accomplish the feat was WARRICK DUNN in 2003 with Atlanta. 4. Arizona quarterback MAX HALL led the Cardinals to a 30-20 victory over New Orleans in his first career start. Hall is the first undrafted rookie quarterback to start in Week 5 or earlier since 1976 (excluding the 1987 season), when JIM ZORN started the first game for Seattle in the Seahawks’ inaugural season as an NFL franchise. 5. San Diego tight end ANTONIO GATES had a touchdown reception in the Chargers’ 35-27 loss at Oakland. Gates has a touchdown reception in nine consecutive games, the longest streak in NFL history by a tight end and tied for the longest streak in franchise history by any player (Pro Football Hall of Famer LANCE ALWORTH). Only five players in NFL history have recorded a longer streak, led by Pro Football Hall of Famer JERRY RICE (13 games). Gates, who has a touchdown catch in each of the team’s first five games this year, joins WESLEY WALLS (Carolina, 1999) as the only tight ends in NFL history with a TD reception in each of the team’s first five games of a season. 6. Arizona safety KERRY RHODES had a 27-yard fumble-return touchdown in the Cardinals’ win. Rhodes, who had a 42-yard fumble-return touchdown last week at San Diego, is the first player since MARCUS ROBERTSON in 1997 to record a 25+ yard opponents’ fumble-return touchdown in back-to-back games. 7. New York Giants wide receiver HAKEEM NICKS had 12 catches for 130 yards and two touchdowns in the Giants’ 34-10 win at Houston. Nicks joins AMANI TOOMER (September 17, 2006) as the only players in franchise history to record 12 catches, 130 yards and two touchdowns in a single game.